What is a Beer Clean Glass? The quickest, easiest, least expensive way to increase draught quality. There is a difference between a clean beer glass and a beer clean glass. A clean beer glass means that it is sanitized and nobody is getting ill. Nice! Beer Clean is an industry term to explain that a beer glass is free from oil and grease inside the glass. And…it has a HUGE impact on how your beer is going to taste and look. Dirty glasses have an invisible film of oil and grease on the inside. This is caused by putting fingers, pop, dairy based drinks, or napkins inside the glass. This gives the beer poor head retention and makes it go flat quickly. 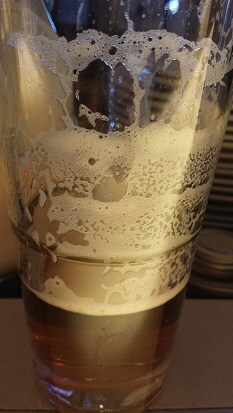 A Beer Clean glass has lacing – Rings of foam left on the inside of a freshly consumed pint glass, like this image to the right. Most pint glasses in the industry are not beer clean.